An EBay vendor has listed this collection of cabinet cards dated 1884 showing LAPD officers. The vendor is also offering other clippings and ephemera linked to William Ernst Stoermer. Stoermer, who died in 1932, was also a firefighter and a locomotive engineer. The photo published on Page 40 of LAPD Capt. 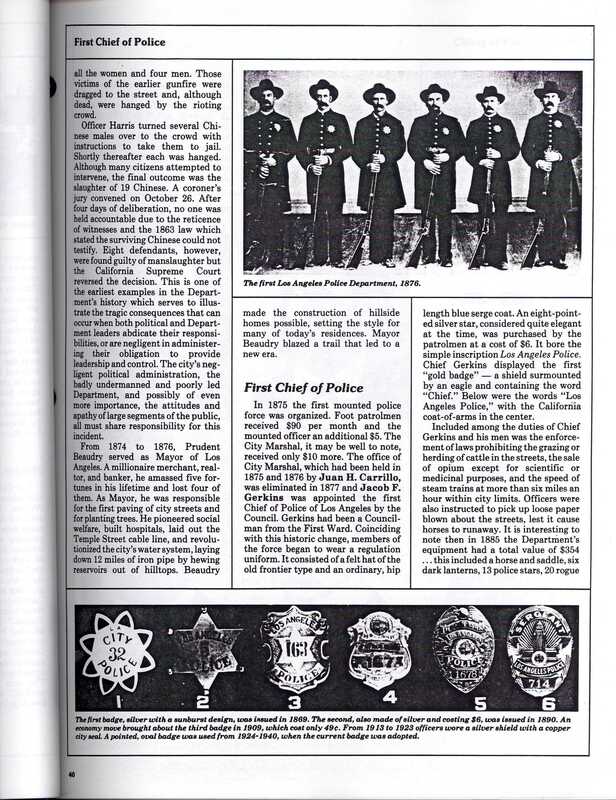 Art Sjoquist’s 1984 “History of the Los Angeles Police Department” labeled as “The first Los Angeles Police Department, 1876” has been the subject of more recent research by Glynn Martin, executive director of the Los Angeles Police Museum. In a 2006 blog post, Martin states that the photo has been displayed at the museum with a brass plaque bearing the incorrect date of 1869. The photo is undated, but research indicates that it was taken between 1887 and 1901, based on the career of Officer Henry W. Marden (d. 1909), one the officers in the photograph. This lot is listed as Buy It Now for $4,500 (note the damage in the upper left corner and along the right side). As with anything on EBay, an item and vendor should be evaluated thoroughly before submitting a bid. And thanks to Mary Mallory for pointing this out! This entry was posted in 1884, Found on EBay, History, LAPD, Obituaries, Photography, Preservation and tagged #EBay, 1884, lapd, photography. Bookmark the permalink.